We all know Craigslist is a great place to buy or sell an affordable car. I'm not so sure it is the best place to buy or sell a not-so-affordable car. But if you have $7,890,000 (you read that correctly, I did not add and extra zero) you can buy a "totally legit" McLaren F1 on CL. 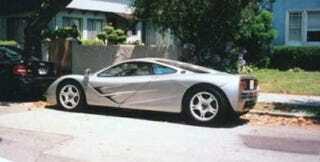 What we have here is an "original 1994 McLaren F1" complete with a 6.1 Liter S70/2 V12 that currently has 614 hp. Seller says the car has lost 13 horsepower since purchased from new. I would like to know where that horsepower went. They are probably hiding out in some kids "claimed" 500 horsepower naturally aspirated Honda VTEC. This F1 also has a top speed of 213 mph with the "Rev limiter" and should return about 15.2 MPG. That extra .2 MPG is very important for people spending almost eight million dollars on something like this. Now you would expect a McLaren F1 going for that amount of money to have "garage queen" miles, but you would be wrong. This particular example has 78,436 on the clock so you don't have to worry about any "break in period." So you could have yourself a beautiful 10 acre Caribbean island and estate for 7.6 million or you can have a car.